Hail to all Star Trek fans across the globe, as you must have heard by now, Star Trek: Enterprise has been cancelled. There are no other Star Trek projects in any stage of development or production, which means Enterprise's cancellation is the final curtain on the entire Star Trek universe. There are probably those of you who raise an eyebrow in doubt and disbelief, figuring there must be a Star Trek feature film in the making and the show in some format or another will be back in a year or two. This is not the case. Enterprise's cancellation 5 weeks ago is the self-realizing prophecy of the UPN execs, as the end result of their years of mistreatment of the show; an engineered failure caused by the complete lack of support by UPN, final burial in the graveyard Friday slot, biased ratings data not helped by nil promotion or advertisement and the complete disregard of UPN and the Paramount studios to Enterprise's and Star Trek's millions of fans all across the world (as all decisions take into account only US ratings and figures). There are probably some among you who don't consider themselves as BIG Enterprise fans (which means you probably haven't seen its spectacular 4th season, recommended for every Star Trek fan). This is not the time to debate and question the quality, storyline or general principles of this particular show. We must unite as Star Trek fans, and fight to keep the Trek going. A worldwide campaign for the show is headed by the founders of the www.saveenterprise.com site and campaign, and the struggle has now reached Israel. First of all, there's an initiative to raise funding from the fans themselves to pay, or at least support financially, the production of the fifth season. Those of you who can contribute please do so at www.trekunited.com. This initiative is not belittled by the Paramount powers-that-be, who said they'd like "to see the money". If nothing at all, raising as much more money as possible will be a sign of considerable strength and unity by the fans. Please, at least check out the site and see if you can add a little extra to the sum. If Paramount will not agree to accept it, the money will be donated to Tsunami relief organizations. Secondly, the campaign is gathering momentum; Hundreds of Trekkers rallied in front of the Paramount studio lots in LA this coming Friday, 25/2/2005, last day of shooting for Enterprise's current season. This event attracted major media attention, and is a pivotal tool for swinging media attention and gaining public support for our struggle, as well as applying pressure on decision-makers at Paramount. We in Israel have joined the common cause! 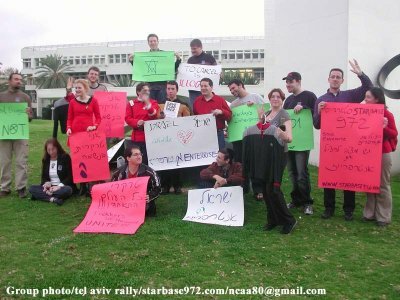 We, Starbase 972, the Israeli Star Trek fan club, have been supporting this cause from the day before the L.A rally and organized an event at the Tel Aviv University. For the official Israeli Campaign videoclip click here. For the full Tel-Aviv rally gallery click here. "Let's make sure history never forgets the name… Enterprise"